Return to Home > Pro-health>Olimp - Magnesan B6 - 50 tabl. Olimp - Magnesan B6 - 50 tabl. 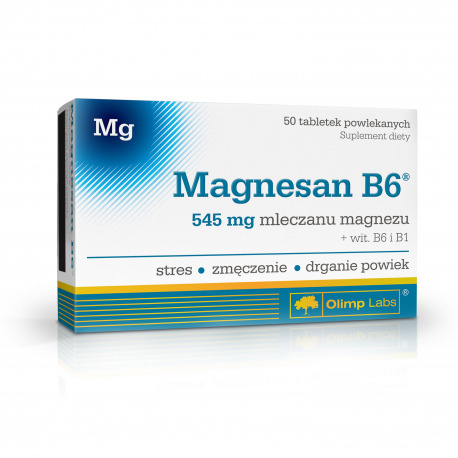 Magnesan B6® is a food supplement which provides magnesium plus vitamins B1 and B6. Vitamin B6 and Thiamine both contribute to normal energy-yielding metabolism and normal functioning of the nervous system. Product intended for: facilitating provision of magnesium to the organism, especially during fatigue, lack of concentration, increased stress, or increased physical and/or intellectual effort. Recommended use: 1 tablet, 1-2 times a day, after a meal. Ingredients: magnesium lactate, microcrystalline cellulose and potato starch - bulking agents, magnesium stearate - anti-caking agent, pyridoxine hydrochloride - vitamin B6, thiamin hydrochloride - vitamin B1; polyvinyl alcohol, polyethylene glycol, talc - glazing agents, titaniu dioxide - colour.